As an adult, and a Type A personality, routines are everything to me. I plan everything out, down to the hours, and live by calendars. As a parent, learning why routines are important for children is something that took me a little while. Now, I would not parent without them! We recently visited our family back in WA state, and my mom brought up an interesting viewpoint. 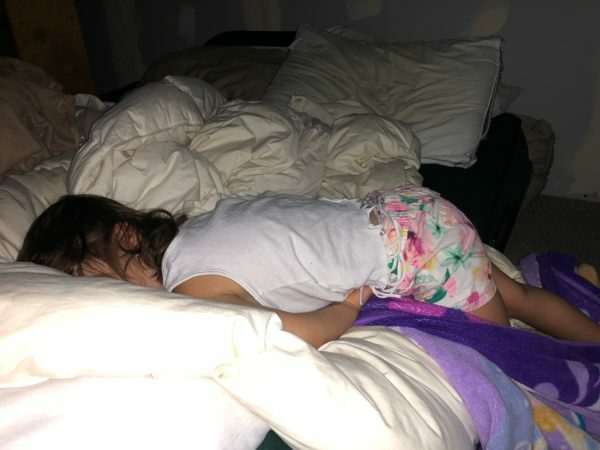 She noticed that even while traveling, I keep my kids on the same routine as much as possible so that when vacation is over and it is back to reality, it isn’t as much of a shock to them. Today, I wanted to share how routines have worked for our family, and my thoughts behind why routines are so important for children, as a mother of four under the age of 6. Children learn what parents teach. If we are showing them that going to bed at random times of the night is the way to do it, then they won’t ever learn what a bed time is. I know that for my kiddos, having set bed time has helped a ton with the arguments that occur, especially in my older girls. Although, our 3YO twins still argue nightly when they have to go to bed, they fall asleep almost immediately. Getting to stay up a little later has become a privilege and a sort of reward system for our older two (4 and 6). Developing a good routine because we, as their parents, taught it to them, allows them to have a sense of structure and pushes them to create good habits for themselves. It gives them necessary breaks during the day. For young children, I have found that whether they think so or not, naps are CRUCIAL to their sanity, and mine. If not, they go downhill quickly. Their attitudes drastically change, they get fussy, and then they don’t sleep as well at night because they are overtired. Or, they pass out in random places, like off the edge of the bed, or sitting up on the couch. It helps increase their motivation and aids in developing time management. This is especially true when they reach the school-age years and they have to get up, every day, to do the same thing. Then, come home every day to get home work done and do it all over again. Having a routine during the school week is something that I found extremely helpful in order for our 6YO to feel like she wasn’t rushing to get things done, or overwhelming herself with tasks at the end of the week. Routine will help your kids all the way through school and into adulthood. Doing this has significantly helped our family, and has helped me as a mom. Plus, there is not a lot of room for inconsistency in parenting when it comes to routines because they are all set. I will be chatting more about that in an upcoming blog post, so be sure to subscribe to our email list if you’re not already! What are some of the routines that you use in your household? I’ve been very adamant too about keeping my little guy on a schedule when we travel!!!! I think it’s so important for all the reasons you listed! For me it meal times and sleep times. As he’s getting older I’m allowing a bit more flexibility so he can practice that too but overall it’s definitely scheduled for us. Thanks for sharing!!! I remembering being so resentful of bedtimes when I was a kid, but the ritual was helpful. Although I do stray for going to bed at the same time like I did as a kid, I still follow a night time routine established as a kid. This is something I constantly nag my daughter about. She needs to learn to impose a bedtime routine for her kids. I know she’s busy and she needs some extra time to do other stuff so she just lets the kids play until late. Establishing a routine will be better for the kids and for her as well. Nothing beats quiet time to start at 8pm, right? This is such a great post and I love everything about it. I do agree we as parents should have set a routine to our kids from playing, eating, bed time and wake up time. Oh this is so true! As a former teacher I learned of the importance routine plays in children’s lives. Now that I am parenting my own children I see it daily. So many miss the cues their children give in regard to needing a schedule/routine to get through their day successfully. Thanks for sharing! I am not so great at routines myself, but this is so true for kids! They love when every day is exactly the same. It really does seem to motivate them and give them a sense of security. Great points and some really helpful ideas! 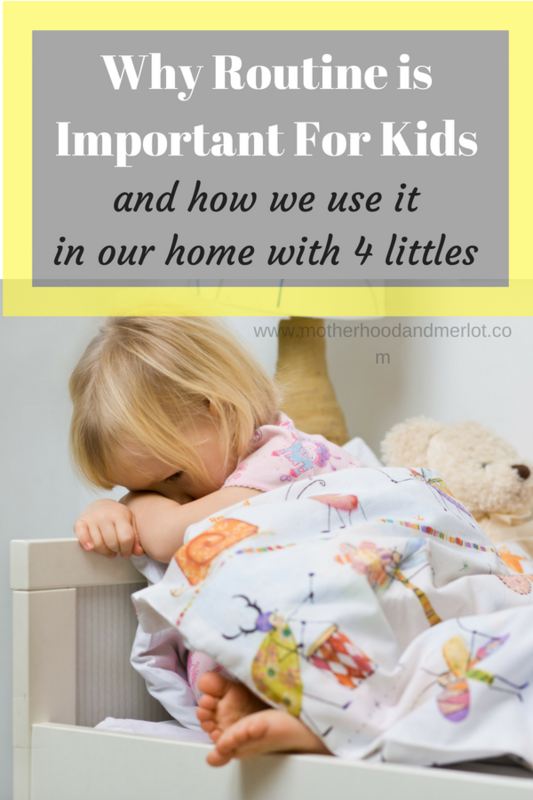 I am a mother to five boys and I’ve come to realize the importance of routine to youngsters. It is easier to teach them wirh routine. I totally agree. I have 5 year old triplets starting Kindergarten and routine has been the key to keeping all of our sanity since the day they came home from the NICU!